Infrared radiation is emitted from all everyday objects. It is radiated from anything with a temperature above absolute zero. Infrared is electromagnetic radiation, similar in nature to light but in a longer wavelength range. Infrared heaters are generally classified into 3 main categories according to peak energy or peak emission wavelength of the element. Far infrared is a very beneficial addition to everyday life, for health and exercise. Infrared heat penetrates deeper into our bodies then conventional traditional saunas. This form of heat creates the human body to perspire more and help eliminate toxins that build up into our system. Any far infrared sauna can be therapeutic, but how therapeutic is the question. This is determined by how much total infrared heat is being emitted from the heater or heat source. Most models on the market emit less than 60% of their heat in far infrared form, and some even less than 20%. What you want is a far infrared sauna which emits over 90% of total heat in far infrared form. 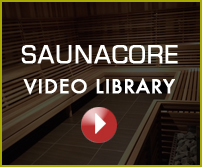 SAUNACORE being a world leader and true Canadian Manufacture of far infrared saunas within Canada has access to many different infrared heating sources available on the market. Ceramic rods, carbon fiber, all different types and brands of infrared heaters that are produced from all areas of the world. SAUNCORE chooses to use only one type of heater in all their Canadian Made far infrared saunas, and that is solid ceramic concave shaped far infrared emitters housed in a surgical stainless steel housing with, stainless steel deflector and shields. The question is why? All this new technology available, why use the ceramic concave emitters that have been used for many many years. For starters, these have history behind them, many health studies from many doctors are based on these type of emitters, these emitters were the only ones available for the majority of the past 20 years. Ceramic heating element, also known as infrared emitters, provides heating by infrared radiation in a similar manner to sunlight. Heat produced by the emitter is not affected by draughts and open spaces – like sunshine, it directs its energy by means of wavelengths towards any object to be absorbed. Ceramic heaters are manufactured from a special ceramic which encases the heating wire and then the entire ceramic assembly is then sealed with a protective glaze. Quality control at all stages of manufacture ensures a very reliable emitter. This is the only type of emitter that boasts a heating efficiency of around 96% -97%; infrared emitters are ideally suited for all types of heating. This type of emitter has a long life, low maintenance and high durability. 96% of the infrared is transmitted through the glaze of the ceramic heating elements. This is the only type of infrared emitter that emits 96% of its energy in a radiant energy form. Being concave in shape, make the form dispersed in a concentrated wave pattern directly out of one front side of the heater, not all around. The ceramic that “emits” FIR is commonly called bio-ceramic. Bio-Ceramic is made from many different kinds of ceramic mixed with mineral oxides, like Silica Oxide (Si02), etc. The mixture is heated together at 1600 degrees centigrade to form the FIR emitting ceramic. After it cools down, it becomes the lead free, bio ceramic with FIR emitting properties. SAUNACORE ceramic emitters are made of natural earth materials. The ceramic emitters that are used have one of the highest glass content in the industry which provides unobstructed transmission and output of far infrared radiant heat. The concave shape allows the heat waves to be dispersed at 180 degree angled pattern. This emission pattern effectively covers every square inch inside the sauna. THE EMF (electromagnetic field) is practically non-existent in the INFRA-CORE due to the fact that the wire changes direction several times over the face of the heater, thus canceling out the most EMF than any other heating emitter on the market. The watt density of the INFRA-CORE emitter is proven ideal for providing the users with the highest output of far penetrable infrared at the most beneficial micron range for the human body. Most far infrared saunas do not emit very high far infrared emissions totals. The reason is that most sauna companies use very little emission material (minimal amount of heaters that are high wattage) in their saunas. They do not tell you this either because they do not know or don’t wish to tell you. The key to INFRA-CORE emitters is the use of 200 watt emitters, which emits 96% of its heat in far infrared form and up to 95% in the 8-12 micron range. This is an ideal emitter made from solid far infrared emission material is best for far infrared saunas. The radiant pattern is only emitted on one side of the concave emitter, sending all of its radiant energy within the sauna towards the user. SAUNACORE uses low wattage, with many amounts of emitters for maximum coverage, of far infrared emitters that give off a 96% efficiency, and concentrated infrared wave pattern. SAUNACORE uses low wattage emitters and increases the amount used in the infrared sauna, this will save energy, will not waste nearly as much heat, and will provide the most beneficial far infrared heat. There are many other types of infrared emitting components which SAUNACORE chooses not to use but are available on the market. SAUNACORE has access to all of the following listed infrared emitters to use in the manufacturing of their Canadian Made far infrared saunas but do not for the following reasons. Here is a basic description of their properties which may vary slightly from manufacture to manufacture. Ceramic Rod / Metal Rod: This is thin metal rod coated with ½” of ceramic coating. This emitter is approximately 80% far infrared emission from this type of heater. A good emitter but too hot and too low of a wavelength. Usually high wattages used in an infrared sauna. Most ceramic rods consist of a helical resistant wire housed in vitreous silica sand enclosed in a metal tube. They have a radiant efficiency of 50% and emit an infrared wave length range of 2.5-6.0 microns. Tubular ceramic emitters have a short life span due to the compaction of the silica sand which tends to short out the helical wire. They also have an extremely high watt density which produces a very high surface temperature area of the ceramic rod, which produces a lower ineffective range of infrared. The EMF of most tubular ceramic heaters is extremely high due to non-canceling wire and non-insulating metal surface. The small surface area of most ceramic rods and tube heaters limits the amount of infrared energy emitted into the cabin toward your body. These 17’’-20” heaters are mounted vertically between the inner and outer wall of the sauna. Since the rod is emits energy in a full circle radius, half the energy is directed toward the outer wall. The reflector trays behind the tubes distort the proper bandwidth when the reflected energy from the shiny trays is redirected into the sauna. Reflected energy collides with newly emitted waves, which further restrict the light energy flow or radiant pattern towards the inside of the sauna towards the user. The type of heater is used by majority of the sauna which come from Asia (China). Flat Carbon or Carbon Panel: These are surface area emitters used in some portable and dome saunas, this is where they first started their use. Most of these heaters have a high EMF output. Wires must be zigzagged to cover the entire heater. These are used by a majority of Chinese made saunas. Much less far infrared emission from this type of emitter/heater. These heaters sandwich a carbon sheet between two fiberglass expoxy resin casings. They operate at a very low surface temperature of 130 degrees F and have a very low radiant efficiency. This type of heating element is also used in automotive industry. Carbon heaters tend to obsorb odors, then re-release the odor back into the sauna. The carbon material has a very low watt density which makes it extremely difficult to completely heat the sauna to adequate temperatures. It also has an extremely high EMF (electric magnetic field) which can be an unsafe environement. Steel Incoloy or Steel Rod: This is commonly made from incoloy steel. The downfall with this emitter is it is too hot. 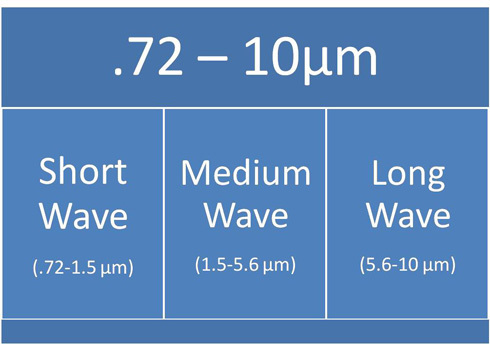 The high heat shortens the far infrared wave length to below 5 microns. Also steel incoloy does not emit much if any far infrared – usually less than 50% total far infrared heat emission. The diagrams below show the radiant emission pattern of the various type of heaters. A – Concave Solid Ceramic Emitter used in Saunacore’s Horizon and Infra-Core Canadian made far infrared saunas. Far infrared saunas manufacture in CANADA. C – Carbon Fiber – used in Saunacore’s Sunset model infrared sauna which is also imported from China and also used in many of the other Sauna importing or retailing companies. (china made saunas). The following is based on a typical 5ft x 5ft Infra-Core Premium Far Infrared sauna and the competitions 5ft x 5ft (3 person sauna). Which sauna would you want for maximum therapy and radiant health benefits and penetration. The ceramic emitter is 96% radiant efficient. It is designed in a concave style shape and reaches a max temperatureof 1292˚F (700˚C) with an estimated life of 10,000operational hours. The emitter is designed with a glazed finish that is easyto clean with its splash proof and non-corrosive features.Not only does it showcase a lower surface temperature, italso has low electromagnetic field radiation and effectivenatural level infrared.The emitter includes a high limit switch and a yellow temp -sensitive glaze that changes colour when energized. De-Activate the Opti-Cool system for a mid-near infrared heat to benefit from pain relief, improved blood circulation, cell health, and skin rejuvenation. The use of multi-level blend of infrared wavelengths to effectively address your own personal health requirments. Unmatched emissivity of “concentrated” far infrared wide spread projection emission pattern backed by more than two decades clinical use.